Portland composite cement is CEM-II/A-M.This cement consisting of Clinker, Gypsum, Pulverized Fly Ash (PFA) Blast Furnaces Slag and Limestone designated by the specification of BDS EN 197-1: 2003, CEM-II/A-M (V-S-L), 42.5 N PCC is the most suitable cement for construction in Bangladesh. CEM-II/A-M contains 85-94% Clinker, which is substantially higher than CEM-II/B-M containing 65-79% Clinker that will give us extra advantage in strength development and increase concrete performance. Both slag & fly ash (PFA) are used in PCC. Percentage of Si0/2 in PFA is higher than slag which is advantageous to gain more long-term strength and ensure durable concrete. This type of Cement is used for large construction all around the world during the last few decades. Hydration process of normal cement produces Calcium Silicate Hydrate (CSH) and Calcium oxide (CaO). Calcium oxide (CaO) does not contribute to gain strength and it is the weak part of reaction that is not suitable for concrete. Since PFA contains higher portion of reactive silica and slag which contains Alumina, it helps to convert (CaO) into CSH to gain further strength. • Low effective alkali content. • High chemical resistance (Sea water, chloride diffusion, sulphate attack. you strong & durable concrete as compared to other cement because this cement contains fewer amounts of alkali, magnesia & free lime, it gives long term strength & durable concrete. This durability features minimize construction damages and help in earthquake/Seismic resistant design. 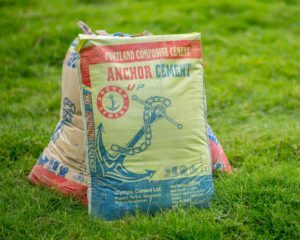 Ordinary Cement usually gains strength within 90 days, whereas anchor cement UP PCC cement continues to gain strength much longer time/period due to its pozzolanic and latent hydraulic reaction its steady strength gaining. Concrete mix with Anchor cement UP(PCC) generally requires less water usually between 5 to 10% by comparisons with OPC cement mix concrete. This gives higher strength PFA & slag particles work like a ball bearing around coarse cement particles. This increases the work ability & eases placing of the concrete PFA & Slag act like a plasticizer. Concrete made by Anchor cement UP (PCC) is cohesive & has reduce heat hydration capacity.Anchor cement UP (PCC ) is made to have low heat of hydration. This results in lower shrinkage & easier curing. Concrete mixes with PCC produce lower permeable dense concrete, which does not allow to penetrate water or air inside finished concrete. As a result reinforcement in concrete can stay longer. This also supplemented with resistance to sulfate and chloride attacks. The use of ordinary cement in concrete allows air, water and other pollutants to enter inside and corrodes einforcements & deteriorates concrete which is not visible from outside. Anchor cement UP(PCC) is ideal cement whose PFA particles make dense & impermeable concrete. Consequently, air and water don’t enter into concrete keeping the reinforcements inside intact. Beside this, Anchor cement UP (PCC) will safeguard your constructions and protect from pollution which may cause by humidity & flood water. We make all efforts in maintaining continuous high level of quality. We ensure the best raw materials sourcing from the best sources & maintain strict vigilance at every step of the cement production process. After production we test the cement each hour at our state-of-the-art laboratory to ensure the consistency in product quality. • Reduce Creep and Cracks.